Construction blueprints and designs also vary greatly for indoor vs outdoor parrot aviaries. Because of these many different requirements, shop bought parrot aviaries can be very expensive and so many bird owners opt to build their very own parrot aviary. The first and perhaps most important point to consider is the size of the aviary. You’ll want the parrot to be able to flap its wings and fly for at least a short duration. 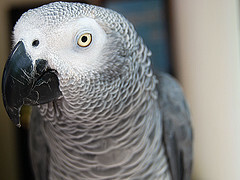 Otherwise the muscles on a parrot can atrophy and they can end up very unhealthy and miserable. If you already have some type of bird cage then a cheaper option may be to extend the existing bird cage by attaching a flight cage to it. Parrots are also one of the most intelligent types of birds around. So they can get very bored if the inside of an aviary doesn’t have perches, some types of greenery and toys that they can play with. 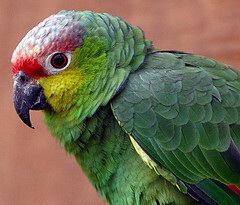 If you have a bare, empty aviary, then a parrot may end up depressed and might start picking away at its own feathers. You also want the aviary to be constructed so that it is easy to clear the floor of any bird waste. Not necessarily a bird construction tip, but definitely consider placing certain species of parrots in pairs. Otherwise these birds can get very lonely when you aren’t giving them enough attention. 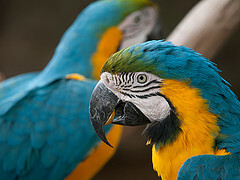 Parrots have very strong claws and beaks that can harm humans, crack open nuts and rip apart wires and wood. 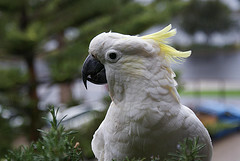 An escaped bird is a very difficult thing to catch and so it is necessary to build the aviary properly from the start. Extra strong wire is needed in a parrot aviary since they have such strong beaks. 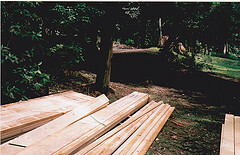 The wood should also be thicker than normal and hardwoods are recommended in construction over softwoods. The same can be said for any wooden panels used in construction, although metal of course can be more durable. Finally you’ll want to be following some proper parrot aviary plans, blueprints and instructions. 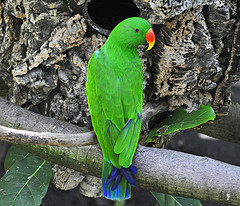 If interested, we recommend checking out our “How To Build An Aviary” construction guide that will offer you plans for both indoor and outdoor parrot aviaries. 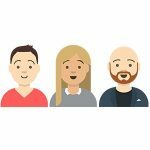 Click here to find out more.